Diep has to be one of my personal favourites that I’ve looked at, its provided me with hours of entertainment and I’m still not bored of it! Diep is a free for all, 2d shooter game where the only rules are kill or be killed. Shoot shapes that passively sit around the map to gain xp or kill other players, once you have enough xp to level you will be offered the option to level up several stats such as maximum hp, bullet speed, bullet damage and several others! Game directions: n the world of Diep you control a tank and shoot projectiles who’s behaviour can be modified through the levelling system to defend yourself and attack opponents. Every 10 levels you will get the choice to modify your overall vehicle and change the way you shoot/play. Like several other io games there is an in game leader board which displays the players score and an icon of the type of tank they are currently using, I’d recommend that new players pay attention to this to begin with so you can get a better feel for strong tank builds. It is highly recommended that you try to move as much as possible as the higher level tanks deal a lot of damage to new players! 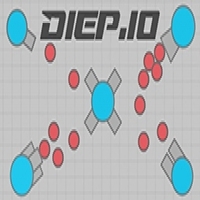 Diep.io Strategy Your tank sits in the middle of the screen and can be moved to navigate the map using the WASD keys or the arrow keys, your gun barrel will follow your mouse cursor however. You can fire your cannon using left click or the space bar.